Unfathomably merciless and powerful, the atomic bomb has left its indelible mark on film. In Atomic Bomb Cinema, Jerome F. Shapiro unearths the unspoken legacy of the bombing of Nagasaki and Hiroshima and its complex aftermath in American and Japanese cinema. According to Shapiro, a "Bomb film" is never simply an exercise in ideology or paranoia. He examines hundreds of films like Godzilla, Dr. Strangelove, and The Terminator as a body of work held together by ancient narrative and symbolic traditions that extol survival under devastating conditions. Drawing extensively on both English-language and Japanese-language sources, Shapiro argues that such films not only grapple with our nuclear anxieties, but also offer signs of hope that humanity is capable of repairing a damaged and divided world. "Shapiro's treatise provides an original, ambitious, contentious, compelling hybrid of searching film scholarship, humanist mysiticsm, autobiography, and polemic. 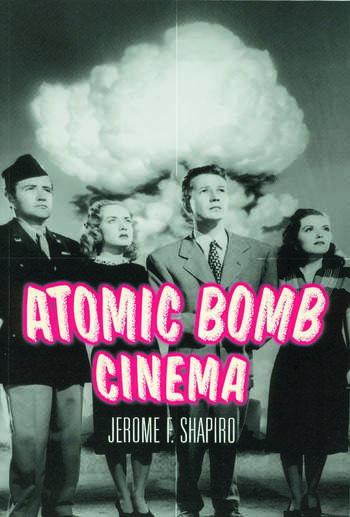 "Shapiro writes well...what emerges clearly is that there has been a relatively constant release of atomic bomb films over the entire period Shapiro addresses. Atomic Bomb Cinema discusses their importance to the apocalyptic imagination admirably. Technology and Culture January 2003."